Are you a fan of wallpaper? I am! So are many of my clients. Wallpapers can add that additional pattern, texture and depth. 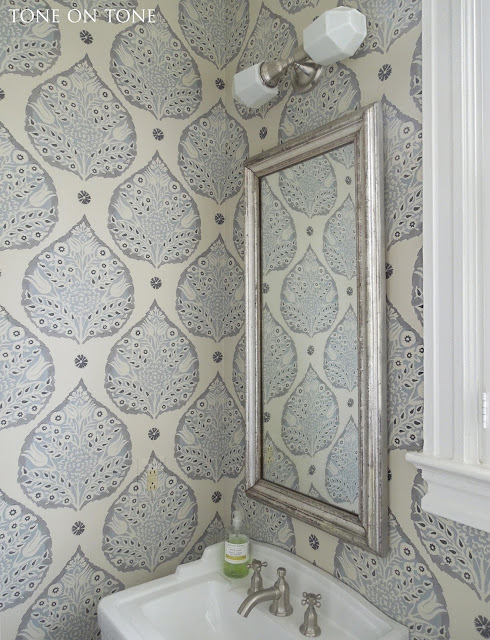 I'm getting ready to paper a historic home's living room and study in two iconic 19th century William Morris designs. Hope to share soon. 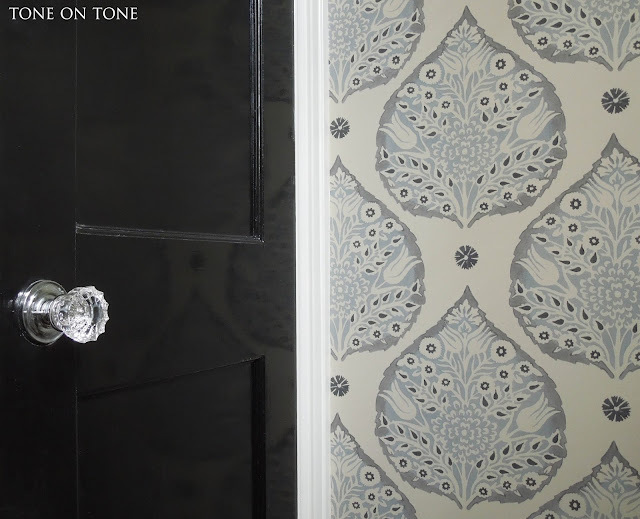 If you're on the fence about wallpapering, why not try it in a guestroom, office or powder room? These rooms allow you to experiment in a less prominent setting and/or on a smaller scale. If the paper turns out to be a mistake, it can always be removed. Measuring 63" x 45", the room is small but not tiny. Let's start with the positives. There is a good-sized window that brings in natural light as well as fresh air. The existing shutters are handsome and easy to maneuver for privacy. Plus, the 9' ceiling adds volume to what could be a claustrophobic space. Now for the issues. The oversized sink basin is a bit deep; the door barely clears. 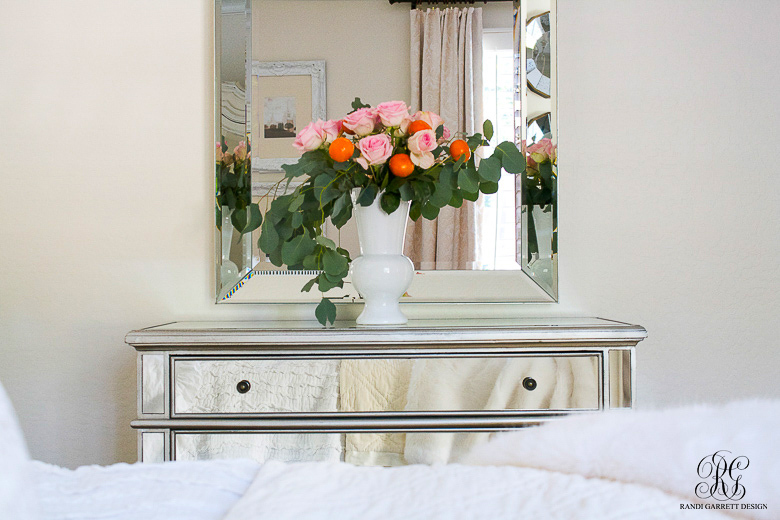 Stylistically, the fluted pedestal base is too formal for this vintage farmhouse. 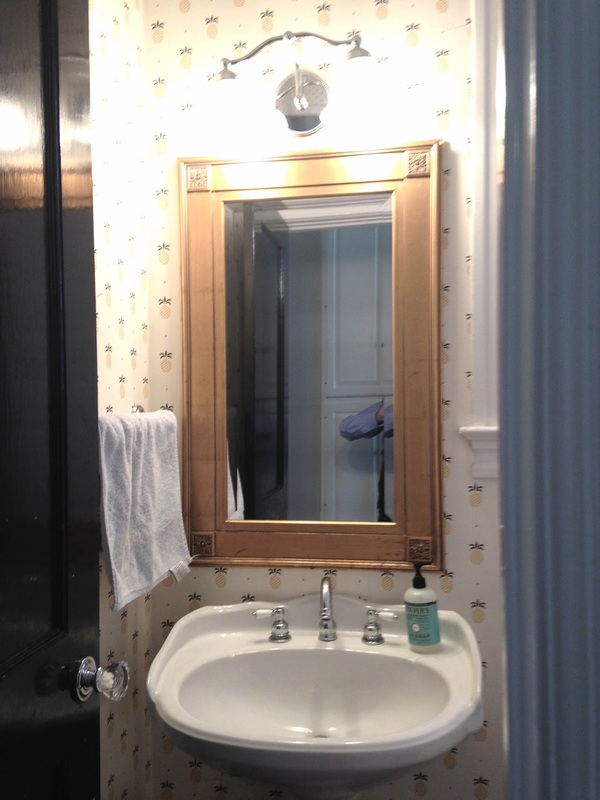 Next, notice how the chrome light fixture clashes with the gold mirror. The light fixture is also mounted too low. 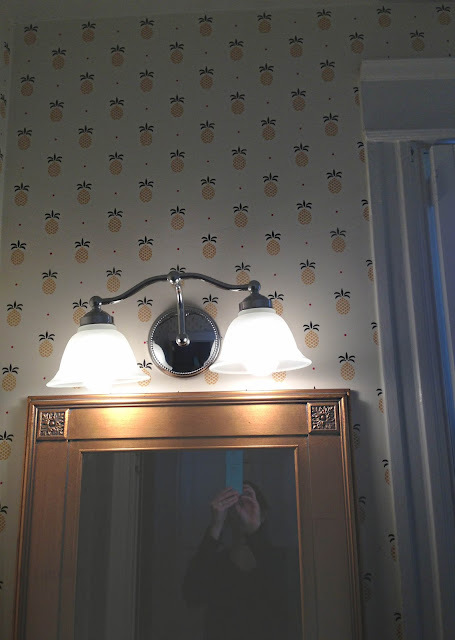 And that Colonial-ish pineapple wallpaper? Too dated for Ceane's young family! 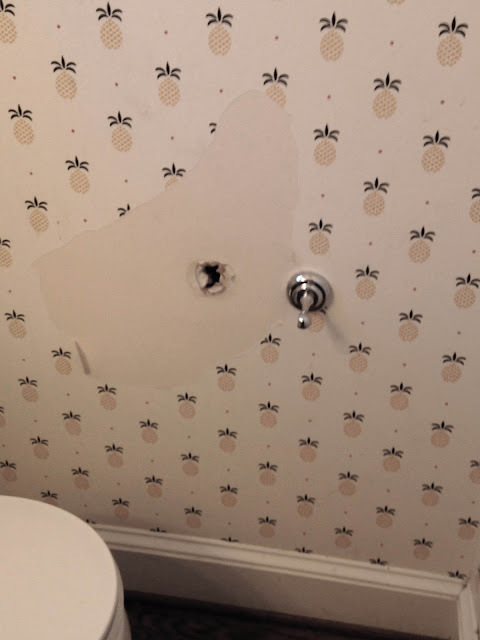 Oh, a piece of it is missing along with the rest of the toilet paper holder :( Time for a renovation! 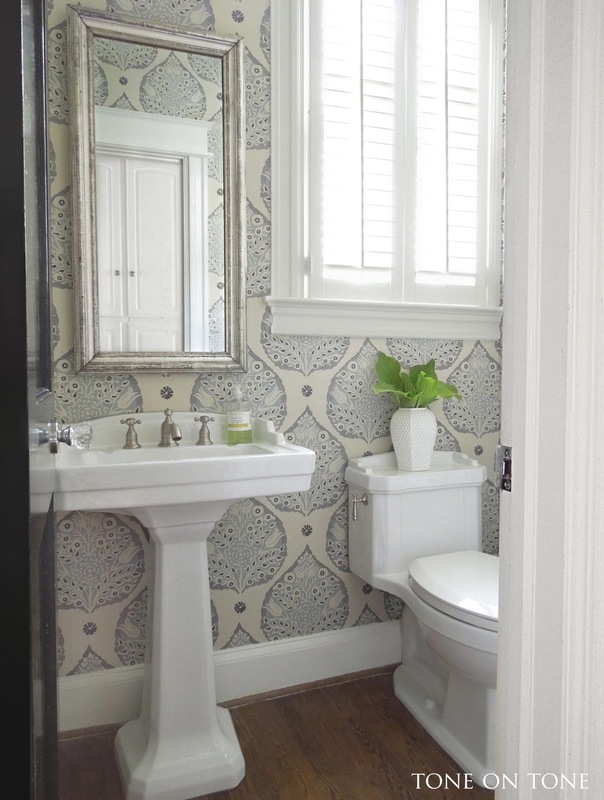 Here is the newly renovated powder room featuring a Galbraith and Paul Lotus wallpaper. 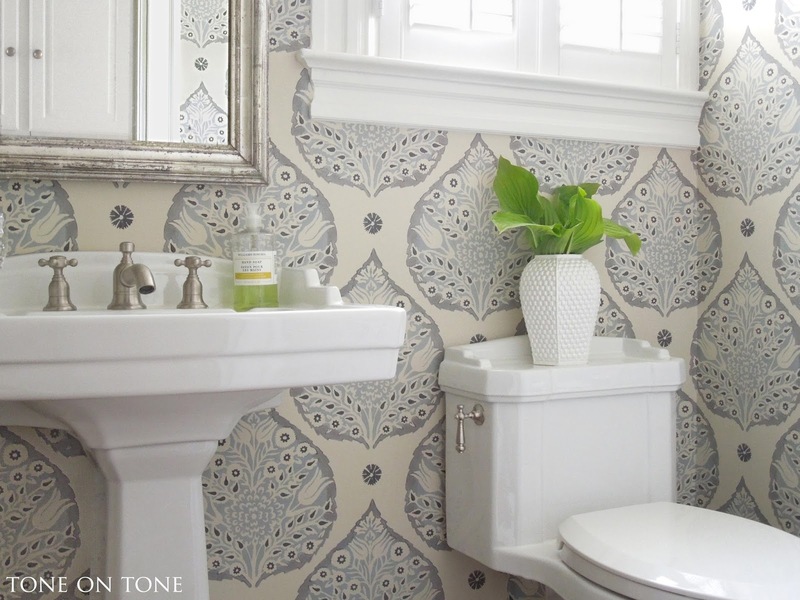 The pattern is a fresh interpretation of classic paisleys. 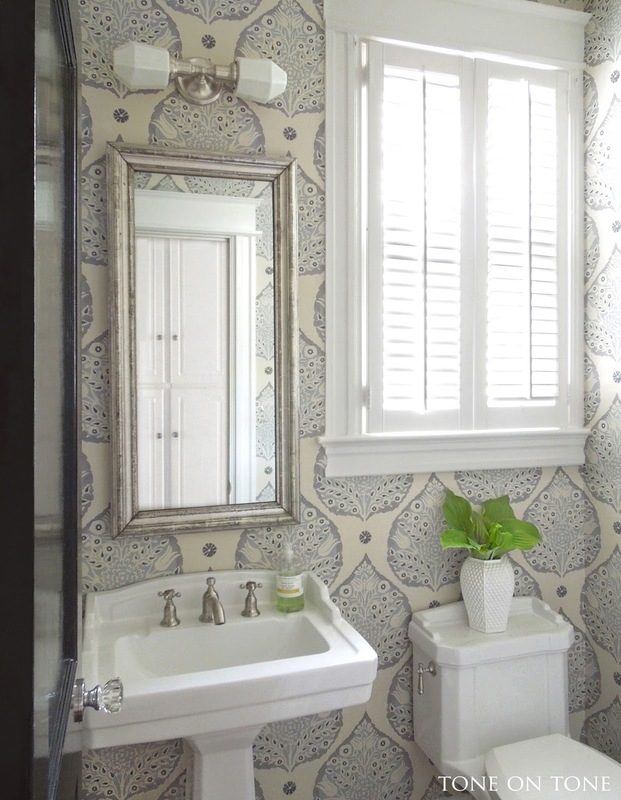 By the way, a large pattern can make a small space feel more interesting, so don't be afraid to experiment with scale. An antique silver gilt mirror from my shop fits perfectly within the narrow wall space, and its cool tone looks striking against the colors. 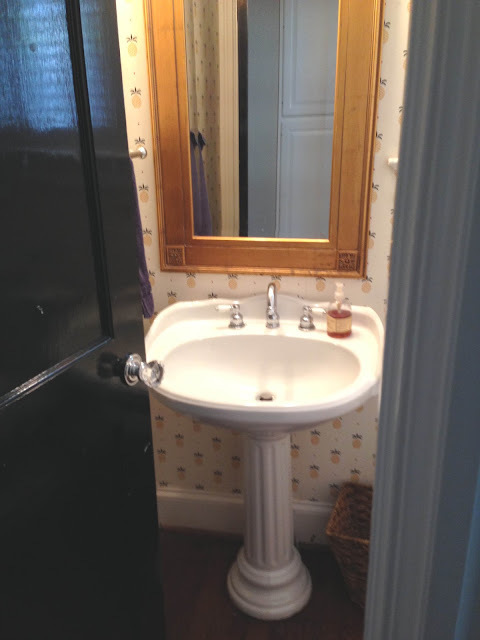 A small pedestal sink with canted corners is reminiscent of bathroom furnishings from the early 20th century. Its backsplash is a bonus; practical for Ceane's three young children. 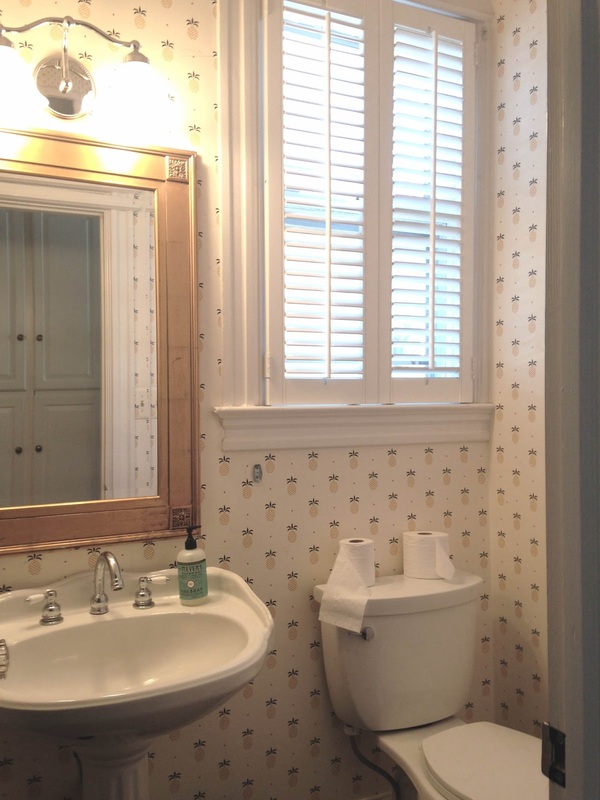 The toilet is from the same collection. 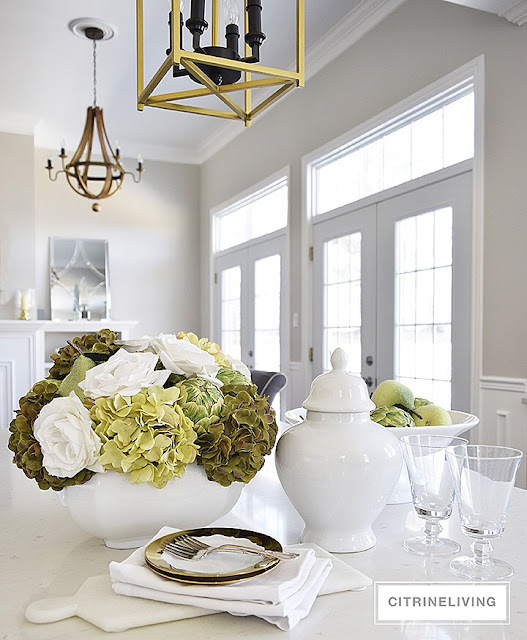 For the new light, I selected a satin nickel fixture with cool glass shades that have a vintage vibe. Note the light is mounted much higher than the old one. With such a tall ceiling, why hug the mirror? Now there is room for both pieces to breathe. 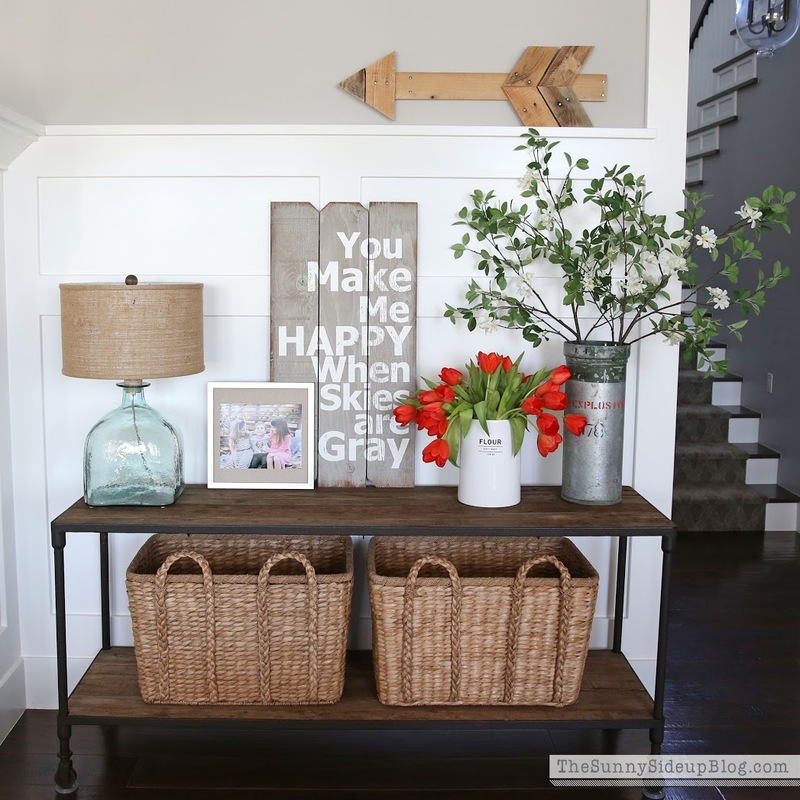 See more of Ceane's beautiful home here and here. A BIG thanks to Ceane!! Is there a prettier season than spring? Just walk outside and behold: all of nature is in BLOOM! So grab your clippers and bring a few branches, blooms and buds to enjoy inside. 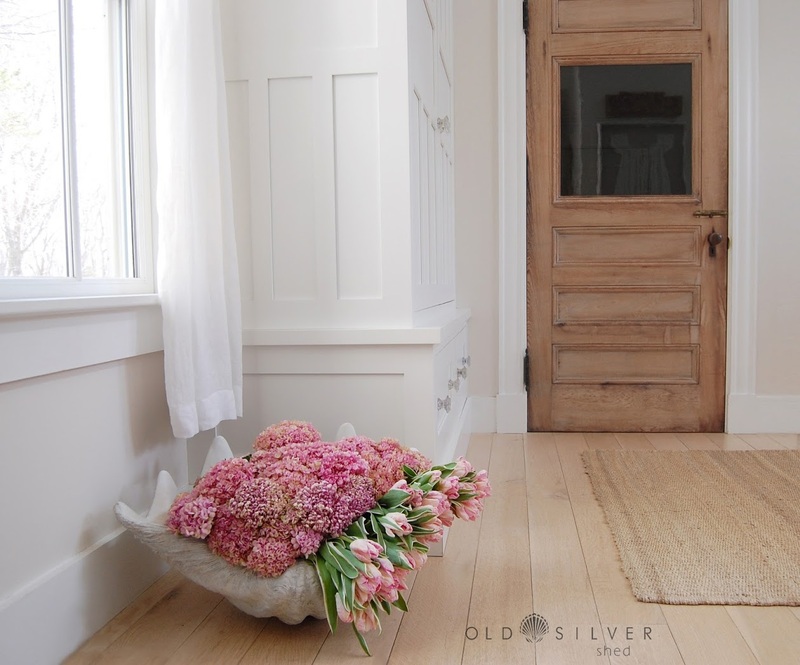 Even in the simplest vase, it's sure to cheer up any room. Speaking of vases, I recently teamed up with a group of friends on INSTAGRAM to each create a spring arrangement in a white vessel. Other than using a white container of our choice, there were no rules. 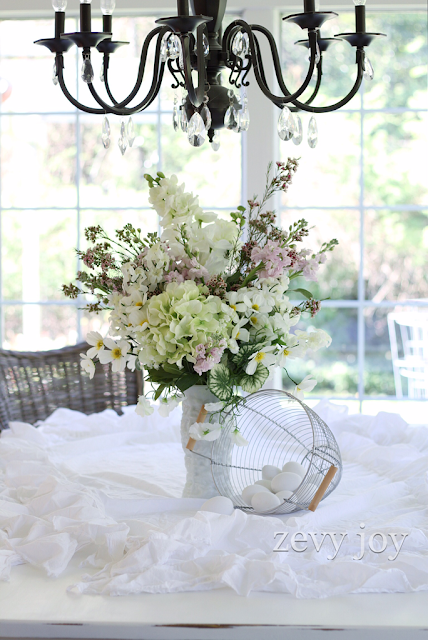 We wanted to show that in a ubiquitous white vase, the possibilities are endless. The creativity from the group was inspiring as well as overwhelming. 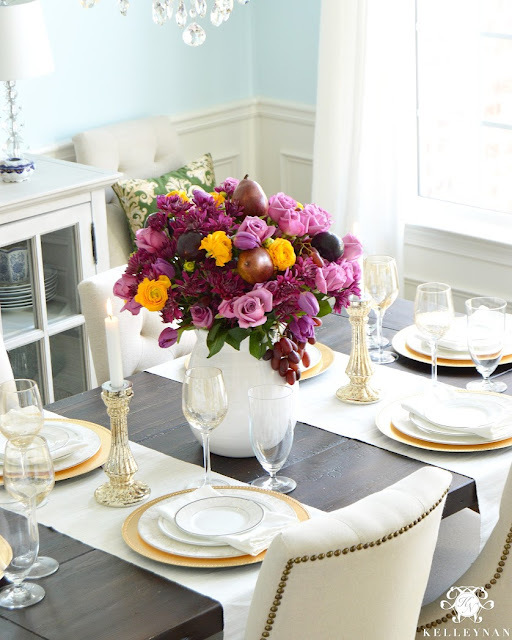 See for yourself and, remember, bring the beauty of spring inside now! For mine, I kept it simple with branches of cheerful forsythia, the harbinger of spring. Clipped from the garden at our new home, the branches are casually dropped in an antique white ironstone pitcher. Note the pitcher's height balances the tall branches. With lemons piled on a footed cake stand, the pops of yellow are pure sunshine, especially against the wall of white china at my shop. 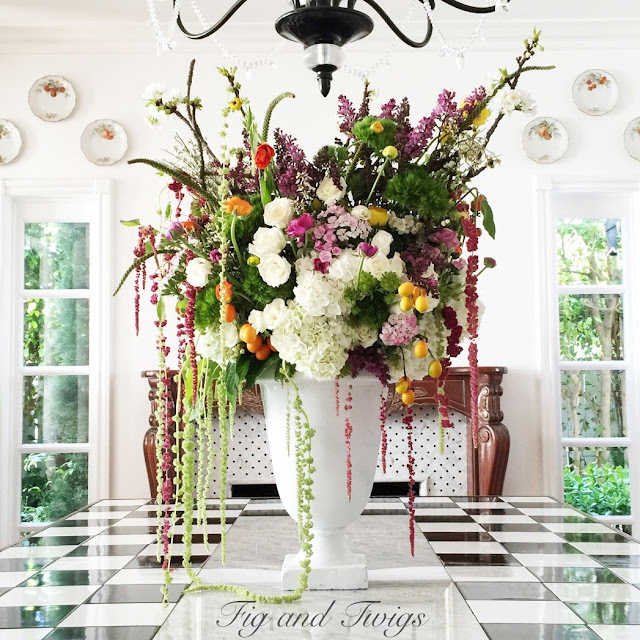 Kelley Nan, who created and coordinated the White Vase Challenge, masterfully mixed fruit, flowers and foliage in her captivating centerpiece. Such happy colors! A special thanks to Kelley for inviting me to participate. Randi Garrett's arrangement of roses, clementines and eucalyptus foliage in a classic urn-shaped vase is lovely. And elegant. Note the asymmetrical layering of the eucalyptus for movement. Marvelous, Randi! Shauna from The House of Silver Lining also incorporated fruit. 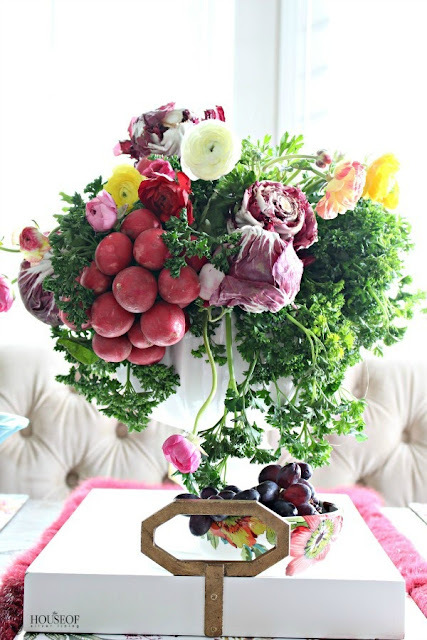 Plus, she tucked in veggies for an arrangement that's original and stunning. The trailing parsley is charming. 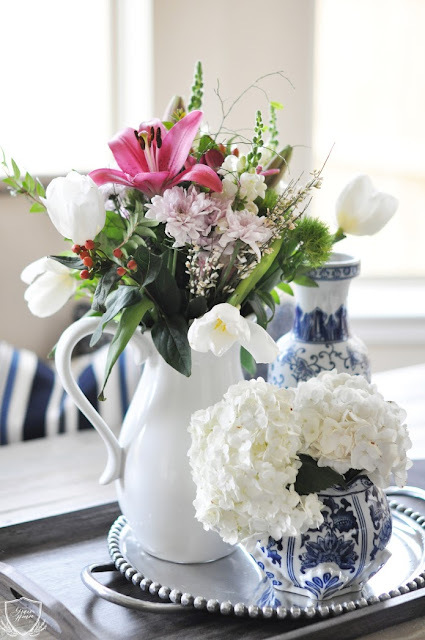 Now let's check out a few arrangements with tulips, starting with this artfully layered vignette from Erin at The Sunny Side Up. Erin's vermilion tulips in white look especially striking against the weathered wood. The entire ensemble is beautiful and organic. A mix of tulips, lilies and other spring favorites in a crisp white pitcher is timeless and fresh. It's from Jennifer at The Grace House. Gorgeous, Jennifer! Gathered from the garden. 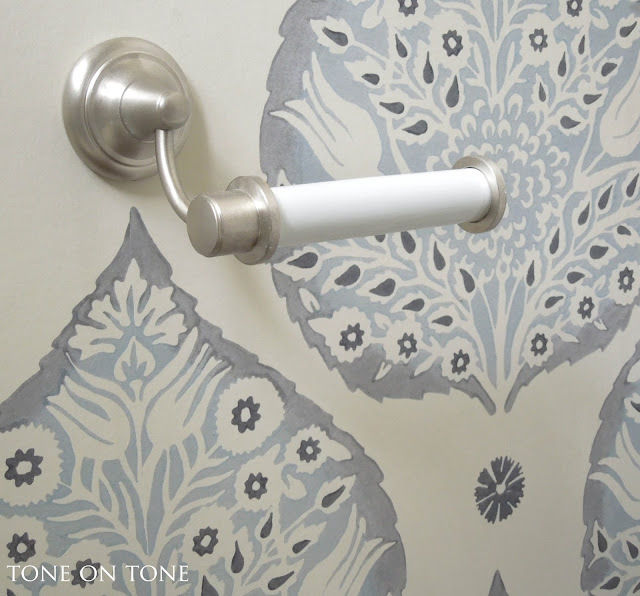 That's Jennifer from Decor Gold Designs' fabulous signature style. In a footed compote, Jennifer loosely interspersed greenery amongst tulips in her carefree, garden bouquet. Divine! Keep it cool. The glamorous Deborah Blount designed a floral creation that shines in shades of purple, lavender and blue. Positively dreamy. And breathtaking! Next is Tamara at Citrine Living's combination of hydrangeas, roses, pears and artichokes in a gleaming white bowl. 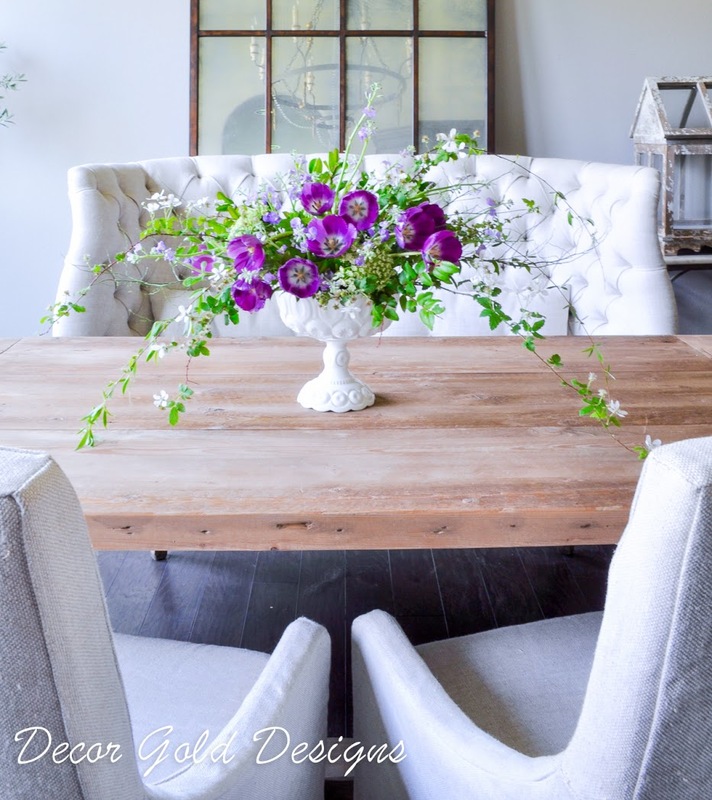 I can envision Tamara's gorgeous piece anywhere - from the dining table to a foyer console. What a classic! Let there be light. 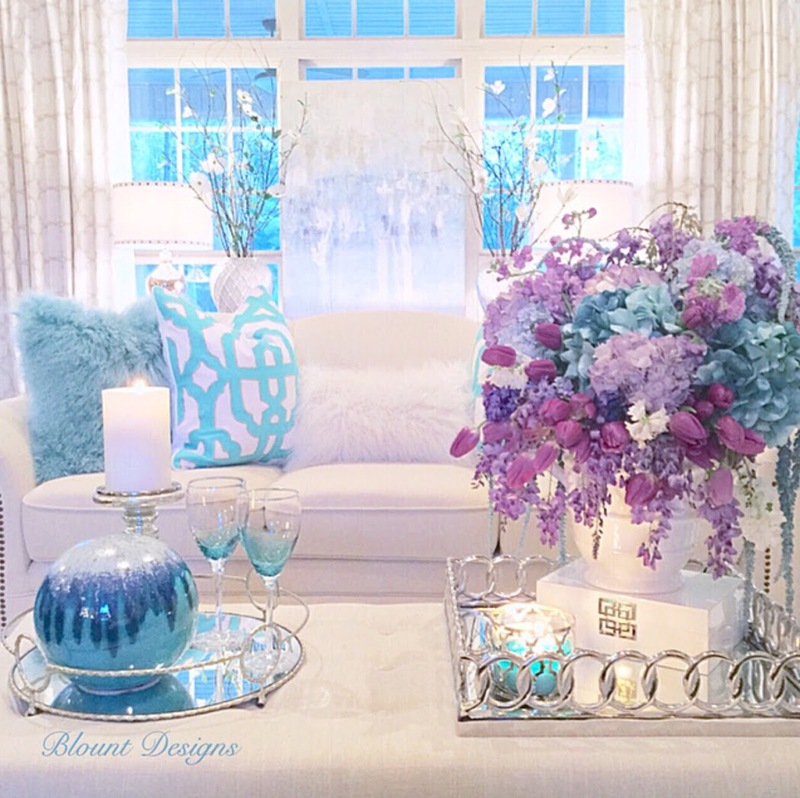 Annie at Zevy Joy selected soft whites and pastel pinks for an ethereal centerpiece that's bright and beautiful. With her garden as a backdrop, it simply says spring. Now a grand masterpiece from Janice at Fig and Twigs. This is floral architecture at its finest. A true piece de resistance from Janice. Hello, sunshine! 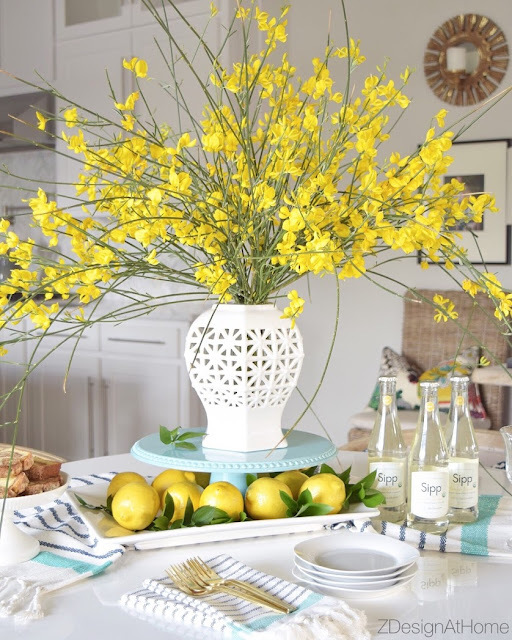 The talented Bree from Z Design at Home put together this vibrant yellow-and-green arrangement. I love the texture as well as movement. Such a happy statement. The last group of friends went white with a twist. 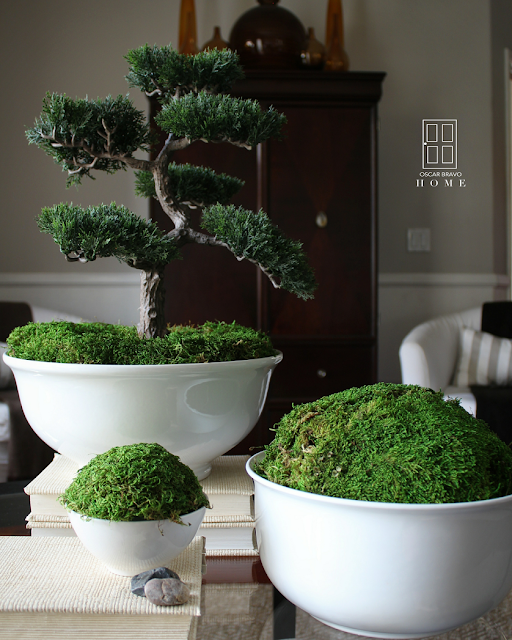 Oscar from Oscar Bravo Home channeled zen with his bonsai and moss covered bowls. Totally unexpected. Totally cool. That's Oscar! Speaking of unexpected, I have to hand it :) to Sandi and Shalia at The Spoiled Home for originality. Brilliant! No wonder these ladies have nearly 100K followers on Instagram. 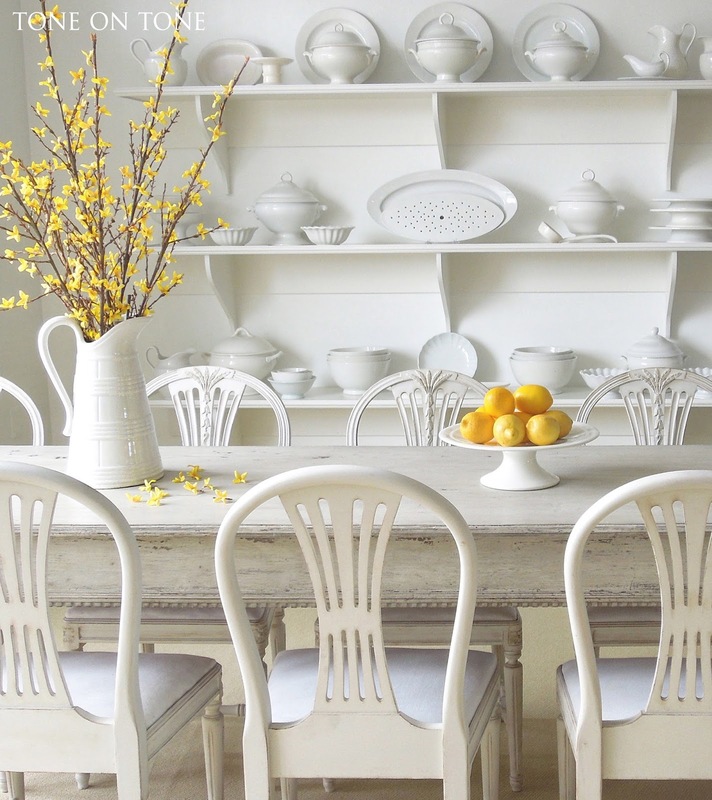 With an enchanting home on Cape Cod, Sandra Cavallo drew inspiration from the sea. Her giant clamshell, nestled in a sunny corner, is overflowing with pink perfection. Stunning! PS - For more, check out my INSTAGRAM.